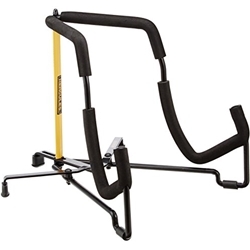 The Hercules TravLite Electric Guitar Mini Stand is a convenient and compact electric guitar stand that folds down flat for easy carrying and packing. It features sturdy steel construction and won't harm your guitar thanks to the specially formulated foam at contact points. All Hercules stands are safe for most nitrocellulose lacquer finish guitars. Folded size: 11.8" x 9.6"